If CO2 emissions are halved by 2050 compared to 1990, the increase in global warming can be stabilized below two degrees C. This is shown by two studies by German, Swiss and British researchers in the April 30, 2009 issue of the journal Nature. 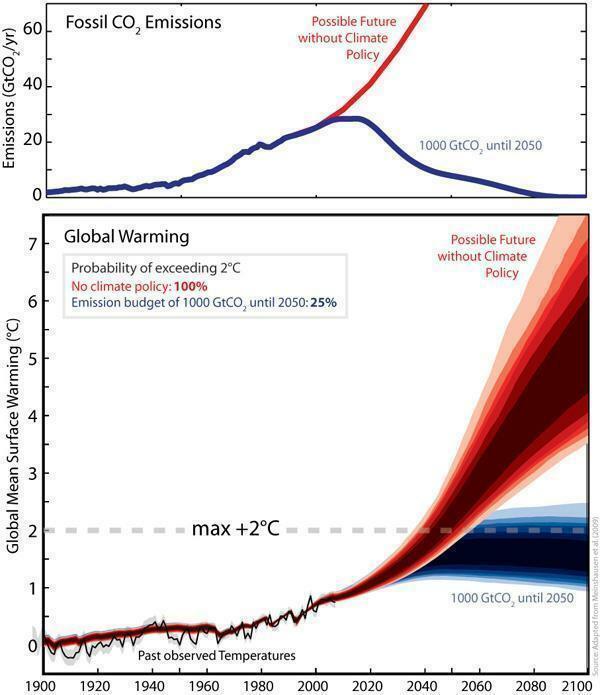 To contain global warming, and its risks and consequences, warming compared to pre-industrial times (pre 1900) should not exceed two degrees C. Although, according to the reports of the Intergovernmental Panel on Climate Change (IPCC), there is no specific temperature threshold for dangerous climate changes, over one hundred countries have adopted this “2°C target.” Scientists have used a new probability model to calculate how much CO2 our atmosphere tolerates under these target specifications. To reach this 2°C target, a maximum of 1000 billion tonnes of CO2 may be emitted into the atmosphere from 2000 to 2050. Roughly speaking, today, around one third of this amount has already been emitted. “The behavior of CO2 in the atmosphere is best described as a full bathtub,” says Reo Knutti, professor at the Institute for Atmosphere and Climate at ETH Zurich, and co-author of one of the two studies. The inflow of the bathtub is large, but the drainage is small. The CO2 emissions are increasing every year, but the CO2 is only removed from the atmosphere very slowly. To not let the bathtub overflow, the inflow must thus be stopped early enough. “It is wrong to believe that the temperature will remain constant with constant emissions,” says Knutti. The models show that there is a 75 percent probability that global warming will not exceed two degrees if a maximum of 1000 billion tonnes of CO2 are emitted into the atmosphere from 2000 to 2050. This number seems high, but 234 billion tonnes had already been emitted into the atmosphere between 2000 and 2006. If emissions remain at this high level, or even increase, the budget would be exhausted before 2030. The results show that time to act is short. Knutti is pleased that greenhouse gas emissions in Switzerland in 2007 were 2.7 percent lower than in 1990 but the values continue to be too high: at least a 50 percent reduction is needed worldwide by 2050; the global long-term goal would be less than one tonne per person per year. Currently, some 6 tonnes of CO2 per person are emitted in Western Europe each year, 19 tonnes in North America and 3 tonnes in China. The researchers believe that the next forty years until 2050, in which, according to the study, CO2 emissions must be halved, will be a good indicator of how global warming will develop. “If, in 2050, we find that our measures have been successful and are working, and if we continue to implement them, we can assume that we are on the right track,” says Knutti. Damon Matthews, a professor in Concordia University's Department of Geography, Planning and the Environment, has found a direct relationship between carbon dioxide emissions and global warming. Matthews, together with colleagues from Victoria and the U.K., used a combination of global climate models and historical climate data to show that there is a simple linear relationship between total cumulative emissions and global temperature change. These findings were published in the June 11, 2009 edition of Nature. It has been difficult to estimate how much climate will warm in response to a given carbon dioxide emissions scenario because of the complex interactions between human emissions, carbon sinks, atmospheric concentrations and temperature change. Matthews and colleagues show that despite these uncertainties, each emission of carbon dioxide results in the same global temperature increase, regardless of when or over what period of time the emission occurs. A recent study by David A.N. Ussiri, Rattan Lal, and Marek K. Jarecki, at The Ohio State University, examined the effects of tillage practices on nitrous oxide (N2O) and methane (CH4) emissions in long-term continuous corn plots. This research is published in the July 2009 edition of Soil and Tillage Research. N2O and CH4 have been linked to climate change. Conservation tillage practices such as no-tillage have potential to increase carbon sequestration in agricultural soils but patterns of N2O and CH4 emissions associated with no-till practices are variable. The study was conducted on continuous corn experimental plots established in 1962 on a Crosby silt loam (fine, mixed, mesic Aeric Ochraqualf) in Ohio. The study consisted of no-till, chisel till, and moldboard plow till treatments. The N2O and CH4 fluxes were measured for one year at 2-week intervals during growing season and at 4-week intervals during the off season. Long-term no-till significantly decreased soil bulk density and increased total nitrogen concentration of the 0–15 cm layer compared to moldboard plow and chisel till. Generally, no-till treatment contained higher soil moisture contents and lower soil temperatures in the surface soil than chisel till and moldboard plow till during summer, spring and autumn. Average daily fluxes and annual N2O emissions were more in moldboard plow till and chisel till than no-till. On average, no-till was a sink for CH4, while moldboard plow till and chisel till were sources of CH4. Lower N2O emission and increased CH4 oxidation in the no-till practice are attributed to decrease in surface bulk density, suggesting increased gaseous exchange. The N2O flux was strongly correlated with precipitation, air and soil temperatures, but not with gravimetric moisture content. Data from this study suggested that adoption of long-term no-till under continuous corn cropping system in the U.S. Corn Belt region may reduce Global Warming Potential associated with N2O and CH4 emissions by approximately 50% compared to moldboard plow till and chisel till management. A recent study by C. López-Fando and M.T. Pardo of the Centro de Ciencias Medioambientales (CSIC) in Madrid, Spain, examined the effects of various tillage intensities on the topsoil profile distribution (0–30 cm) of pH, soil organic carbon (SOC), organic nitrogen (N) and available nutrients on a semi-arid soil from Central Spain. This research is published in the July 2009 edition of Soil and Tillage Research. The authors examined the effects of several tillage intensities: no-tillage, minimum tillage with chisel plow, conventional tillage with moldboard plow, and zone-tillage subsoiling with a paraplow applied in alternate years in rotation with no-tillage. Measurements made at the end of 5 years showed that in the 0–30 cm depth, SOC and N had increased under no-tillage and zone-tillage compared with minimum tillage and conventional tillage. Most dramatic changes occurred within the 0–5 cm depth. No-tillage and zone-tillage plots, however, exhibited strong vertical gradients of SOC and N with concentrations decreasing from 0–5 to 20–30 cm. Soil pH under no-tillage and zone-tillage was 0.3 units lower than under minimum tillage or conventional tillage at a depth of 0–5 cm. This acidifying effect was restricted at the surface layer and in the 20–30 cm interval, pH values under no-tillage and zone-tillage were higher than in minimum tillage and conventional tillage plots. These results suggest that in the soil studied, zone-tillage in rotation with no-tillage maintain most of the advantages associated with no-tillage, and present a definite potential for use as a partial-width rotational tillage practice. The Waxman-Markey bill, the leading climate legislation in Congress, will create such huge demand for offsets in the US that project developers will struggle to meet it, sources say. Even with plans to scale up the UN’s clean development mechanism (CDM) beyond 2012 as part of a global climate pact to succeed the Kyoto protocol, many believe potential for the mechanism is limited, especially with huge demand coming from the US. “It’s virtually impossible to go that way, which is why the US is choosing another way,” said Lex de Jonge, chairman of the executive board which oversees the UN project-based scheme to generate carbon credits in the developing world. of domestic offsets -- to meet the GHG reduction targets. The UN predicts around 1.6 billion CDM credits will be generated by the end of 2012. The CDM has generated a total of 289 million credits to date since projects started coming through the system in 2006. “I’m concerned that in the early years (of a US cap-and-trade system) those offsets just aren’t going to be there,” said George Frampton, a lawyer for US firm Covington and Burling. Despite running over 900 pages, the Waxman-Markey bill makes no specific reference to the CDM. It says any foreign offsets allowed into the US scheme must first be approved by the Environmental Protection Agency. The Waxman-Markey bill suggests offsets generated from forestry projects could meet a significant part of the supply required to meet its cap. Despite deforestation accounting for almost 20 per cent of the planet’s GHG emissions, the development of forestry offset credits has stalled due to the immense complexity involved in setting up a fair and verifiable system. “It’s not going to be easy. But avoided deforestation is one of the likely options (for generating enough offsets) and that is going to become an enormous business,” said Covington’s Frampton. Advocates of carbon offsets, ranging from farmers to project developers, are making a last-minute push to get language added to the House climate bill that would specify what types of projects would be eligible for compliance. The Waxman-Markey bill, which was approved by the House energy committee in May, is now being reviewed by several Congressional committees who could make changes to the bill. House Speaker Nancy Pelosi said the committees have until June 19 to review the bill so it can be considered on the House floor later this summer. types would be acceptable, leaving those decisions for later. The agricultural sector has been particularly vocal about the need for the inclusion of land-use and forestry offsets. One of the strongest advocates for that is the 25 x 25 Alliance, a coalition of agricultural, forestry, business, labor, and environmental organizations. The 25x'25 Alliance today issued a list of proposed amendments to the American Clean Energy and Security Act (HR 2454), also known as the Waxman-Markey bill, that the organization said are needed to maximize the benefits that agriculture and forestry can provide in the cap-and-trade program outlined in the measure. Rudgers said that the Waxman-Markey bill must fully recognize that agriculture and forestry are uniquely positioned to deliver a high volume of low-cost offsets, particularly during the early years of a cap and trade program when a quick start is most urgent. And, he said, agriculture and forestry have much to gain from this opportunity in the form of a new revenue stream. Domestic offsets must have identical characteristics and risks, i.e. fungibility, with each other and with allowances. Sequestration offsets must be for a contracted duration, with a suggested "permanence" of fifty years. Biological sequestration offsets must be credited at a discounted rate so that the difference between the value of the full offset and a discounted offset is the source of funds to manage all risks of reversal, such as from a forest fire. The measure must recognize the abundant offset protocols and methodologies that have been previously developed under other programs by allowing the program administrator to quickly establish a list of pre-approved project types. The bill must direct the program administrator to devise protocols, methodologies, procedures, registry requirements, verification requirements, and any other relevant process issues to be as operationally lean as possible and reduce overhead costs of compliance. USDA should be the lead agency to assume responsibility for the majority of farm and forestry offset functions. Domestic offset providers from the agriculture and forestry sectors should be treated equally under the Strategic Reserve, a price management mechanism, which sets aside extra permits that can be allocated to prevent unexpected allowance-price fluctuations. Agriculture and forestry stakeholders currently engaging in land management practices that provide offsets - "early actors" - should be recognized under the cap-and-trade program and specifically protected against any bias that could accrue to other offset providers. "It's critical that the current legislation be amended to provide the kind of necessary detail that will insure the viability of the cap and trade system's offset components," Rudgers said. To read and download a detailed summary of the 25x'25 Alliance's recommended amendments to HR2454, click here. In 2003, under the Department of Energy’s (DOE) Office of Fossil Energy, the National Energy Technology Laboratory (NETL) launched the Regional Carbon Sequestration Partnerships, a strategy to involve all regions of North America in its CO2-mitigation efforts. The seven Partnerships represent over 350 state agencies, universities, and private companies in 42 states and 4 Canadian provinces. They are developing methods for storing CO2, as well as creating public outreach documents, websites, and digital data information systems to further the understanding of CO2 capture and storage. Phase I of the carbon sequestration effort, completed in 2005, focused on such endeavors as gathering a national network of companies, professionals, and government officials to work together to support sequestration. Phase II saw the implementation of small-volume field tests of geologic and terrestrial sequestration in areas found favorable for carbon storage during Phase I. Phase III began in 2008 and will run through 2017. Large-volume sequestration efforts will answer questions about such practical issues as sustainability, design of wells (for both integrity and capacity), and reservoir behavior with prolonged injections. Key operational issues will vary, because each region has distinct geologic formations, overlying seals, and structural concerns that can affect the safe and permanent storage of CO2. Results from Phase III efforts will provide the foundation for commercialization of carbon capture and storage technology. The goal of this effort is to have the commercial deployment of carbon capture and storage ready and cost effective by 2020.